Police arrested three men in Lebanon on Sunday who allegedly tried to steal this shed. 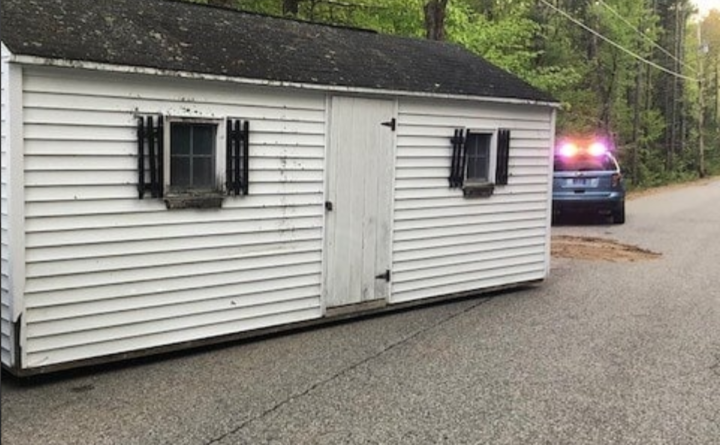 Three men who allegedly tried to steal a yard shed in Lebanon were only able to drag it about 25 feet before police caught up with them, authorities said. Police responded to a foreclosed property on Pork Street on Sunday after someone reported a trio of men were using a pickup truck to drag a large, white shed from the property, according to the Maine State Police. The men only got about 25 feet down an adjacent road before troopers arrived and discovered the shed wasn’t theirs, police said. At that point, the shed was blocking traffic on Heath Road. While questioning the group, troopers also found that one of the men, Matthew Thompson, of Lebanon, had crystal methamphetamine and prescriptions pills on his person. Police arrested Thompson and Robert Breton and Timothy James, both of New Hampshire, and brought the group to the York County Jail in Alfred. They are being held on $5,000 cash bail. York County sheriff’s deputies assisted with the arrest. Each man faces theft and reckless conduct charges, while Thompson faces two additional counts for drug possession, police said.